Design Patent: Unique curved appearance, come with durable material, simplified and beautiful. 8 Bright LED Lights: Not only looks gorgeous, but also produce a super bright level of illumination. Updated Solar Panel and Battery Capacity: Getting faster charging in less sunshine environment, and longlasting illumination time. Dusk to Dawn Mode: Dim light when the ambient brightness is dark, fully bright when motion detected. Reduce replace frequency with supreme quanlity. Unconditional, Money-Back or Replacement Guarantee by HonestEast. 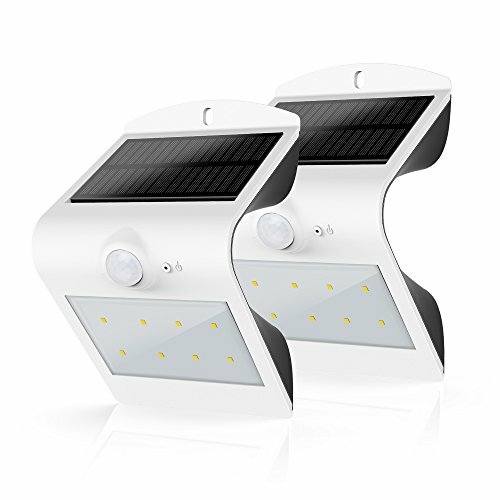 The HonestEast Solar light can be used in all areas without electricity that has full sunlight such as Balcony, Windows, Gate, Wall, Porch, Passage, Alley, Pavilions, Buildings, Block, Outdoor garden decoration,Country lane etc. Unique curved appearance, simplify and beautiful. There are 8 LEDs(6000 kelvin) on the front panel, and 2 LEDs(3000 kelvin) on the reverse. Low light decay, long lifespan. 3.7v/2000mA lithium battery, charged 6 hours can continually work more than 24 hours. Exposed to the sunlight over 8 hours can be full recharged. Intelligent human body induction lamp, once a person steps into the induction area, it will turn to full bright model. If you stay still or walk out of the induction area, after 15-20 seconds it will turn to dim light model. 1.Adopt high quality mono-crystalline silicon solar panel, high conversion solar photo electricity, thus getting faster battery charging in less sunshine environment. 2.High Quality Product Shell(PBT Plastic), it offers numerous benefits like stain resistant, high strength and stiffness, good durability and never turns yellow after aging.